SAN ANTONIO, TX (March 3, 2015): Buyers in search of a new home in San Antonio may now choose from a variety of floor plans in the master-planned community of Fronterra at Westpointe. Home shoppers are invited to tour the new model home, The Rohan, now open daily for tours. 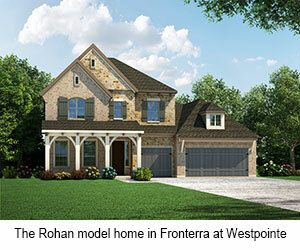 The Rohan is a two-story home with four bedrooms, three full baths and one half bath. With more than 3,500 square feet of living space, design features include an outdoor living area, media room and study. The model home is located at 12014 Upton Park. David Weekley is now building energy-efficient homes on 60-foot homesites in the first phase of this community. Priced from the $335s, homes in Fronterra at Westpointe range in size from 2,400 to nearly 3,500 square feet. Residents will enjoy a nearly five-acre amenity center, great shopping at Alamo Ranch, nearby Government Canyon State Natural Area and proximity to Lackland Air Force Base and Fort Sam Houston. There is also a community playground, pool and cabana. Students will attend Northside ISD schools, including William J. Brennan High School within walking distance. For information about David Weekley homes in San Antonio, homebuyers may call 877-933-5339 or visit www.davidweekleyhomes.com.